The governor of New Mexico has ordered the withdrawal of the majority of the state’s National Guard troops from the U.S. Border with Mexico. The move that challenges President Trump’s description of a security crisis. Governor Michelle Lujan Grisham announced the partial withdrawal shortly before Trump’s State of the Union address. The move challenges President Trumps contention that there is a border crisis. Grisham said that she does not believe there is a security crisis on the border. Her Republican predecessor deployed National Guard troops to the border in April of 2018, at Trump’s suggestion, and 118 remained there before Tuesday’s reversal. 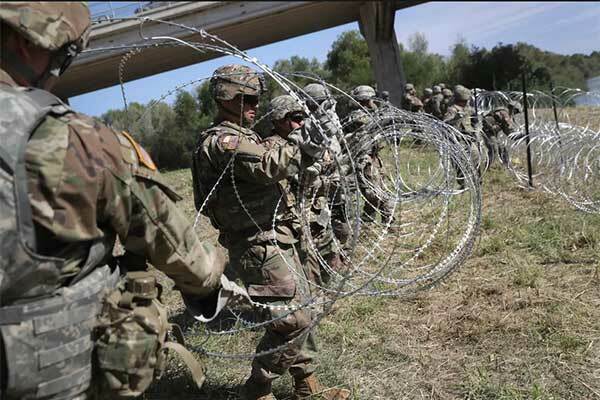 “New Mexico will not take part in the president’s charade of border fear-mongering by misusing our diligent National Guard troops.” said Lujan Grisham. “We will not militarize the border,” she continued. “We will not use our assets and our National Guard in an inappropriate way. We will also not turn a blind eye to any New Mexican who is truly at risk and who needs resources. We share with the state and federal government to address these problems,” said Lujan Grisham. At the same time, the governor said a small contingent – around a dozen guardsmen – will remain in the southwest corner of the state to assist with humanitarian needs in a remote corridor for cross-border immigration. She also mobilized state police to assist local law enforcement. New Mexico’s contingent of border troops is dwarfed by recent federal deployments of active duty troops to the border to assist Customs and Border Protection.